Stanley and Man Tripping have come together to create an opportunity for you to get redemption and win some great prizes at the same time! Everyone of us has done something we regret at one point in our life, but now is your chance to make amends. 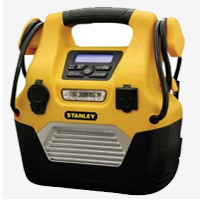 We'll be giving away two Stanley Digital Power Stations, and a Stanley Instant Jump-Start to some lucky winners. All you need to do is tell us what you did and why you are sorry. Man Tripping's writers and guest judges will then pick the best stories and post them online for the rest of you guys to vote on. Even if you haven't done anything you need to apologize you can still win - just join us on Facebook, or subscribe to our email list and we'll hook up one lucky winner with a Stanley Digital Power Station that way too! You Can Win Without Entering Too! We'll also be drawing a lucky winner from our Facebook page and our email list, so make sure you signup there too! This is pretty much the ultimate mancation accessory! From cables to jumpstart a dead battery to portable AC power for keeping your mobile phone charged at the camp site, and even an air compressor to make inflating that beach ball a snap, the Digital Power Station has it all. It even has a USB port to power devices that way to! 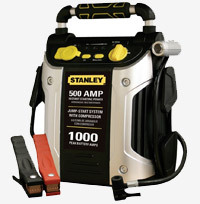 Like its big brother, the Stanley Instant Jump-Start will help get your car going again after a dead batter, and it also includes a 120-psi air compressor for inflating bike tires, beach balls, rafts, and other inflatable items that you might take on your next mancation. Remember: The more outrageous your act and the better your apology, the more likely it is that we'll be able to help you find forgiveness!